Let’s impress your guests with our wide range of aerial fireworks packages. 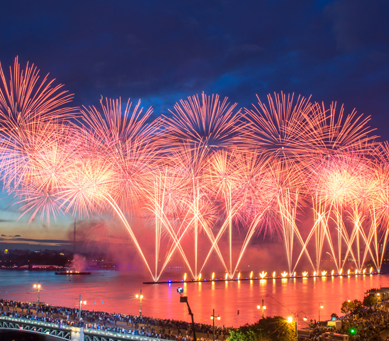 Our catalog of fireworks and huge variety of pyrotechnic effects creates stunning and breath-taking effects that will turn every moment of the night into a cherished memory. And we have just the right package for everyone! That’s our dedication to quality and customer satisfaction. Whether it’s a small birthday party, or a huge community event with thousands of people, you can count on us. for that perfect pattern in the skies with precise timing of firework shell explosions, we’ll make it happen in a snap. Our pyrotechnic specialists have mastered this art. We’ll shoot sub-shells and stars at the right altitude and the right propulsion to give you that ultimate moment of celebration. With our multi-shot aerial cakes, you can bet that we’ll push the possibilities beyond the limits. And safety is always our top priority. Combine this with our multi-shot aerial cakes and you get those glowing patterns in the skies that’ll leave a smile on everyone’s face. Our aerial fireworks bring the real fun of the party to the right people. We know what it takes to rock a party! So when it’s about celebrations and parties, we’ll use that perfect mix of aerial fireworks to make your event stand out from the rest. To us, every comet, every salute and every aerial firework is a quality statement. We understand that your wedding, graduation or community party is a once in a life time event. That’s why we’re offering you something unique. Something that will easily set you apart from everyone else. Classic fireworks that will be as memorable as the party. It’s time to give your guests something more than the food, drinks and dance. Push your party beyond the edge by organizing an elaborate fireworks show. Let’s create that unforgettable, everlasting impression.